All I want to write this week is a goofy op/ed piece making fun of the 12/21/2012 Apocalypse that wasn’t. I want to be funny and have a little Christmas cheer. But the world DID end last week for a lot of people in Newtown Connecticut. 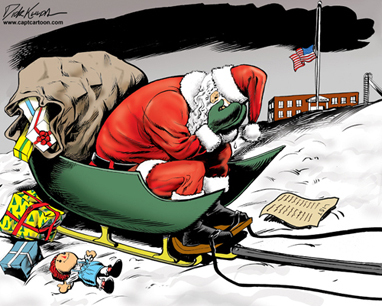 And last Friday evening, in a Wal-Mart parking lot, I did something somewhat uncharacteristic for me: I burst into tears, listening to the news reports coming in from Sandy Hook Elementary School. And at that moment I felt like there was just no hope left. All of the slain children were either 6 or 7 years old. Dead. Shot multiple times a week before the most joyous time of the year for so many children. Google “School Shootings” (not just a problem in the US) and you will be stunned by the sheer number and details. But it’s not just schools: Airplanes, malls, movie theaters, none are safe anymore. And to be truthful, as I write these words I keep thinking, why even bother writing? What can I add? What can I say? People much smarter than me can write so eloquently, but as a somewhat reasonable person I can write from the heart, and maybe I can share with you my greatest fear of all of this: Nothing will change. For the next few weeks, the news magazines will run pictures of vigils and lit candles. “Experts” from all sides will debate every aspect of what happened. We will get to know the children, the adults, and the shooter and his family. People from all walks of life will get into a war of words about gun control. There will be hearings, investigations. It’s all part of it, all necessary. But… what if nothing changes? That is what scares me the most. Because so far, nothing has changed. Columbine. Virginia Tech. Ohio. The Aurora movie massacre. Countless others. We move from one massacre, one shooting, one attack to the next and nothing changes. We always say ***enough*** but nothing changes. Politicians will read prepared statements and nothing will change. We as a nation will express our outrage and nothing will change. Grief counselors and crisis managers will be sent to Connecticut and nothing will change. We’ll talk guns and nothing will change. Eventually most people will move on and get back to celebrity sleaze, sports, and politics and put Newtown out of their minds. People, IT HAS TO CHANGE. Sandy Hook MUST be the breaking point, the proverbial straw, the events that says it’s time to throw out whatever book is being used to process these horrific events, because they keep happening. Because what we do doesn’t work. Because if the murder of 20 six and seven year olds isn’t the breaking point, what will be? It has to stop. And I think that we need to look deeper. It’s time to REALLY look in the mirror, as a country, and see what isn’t working. We need to change that. I’m not talking extremes — none of us is advocating a totalitarian society. A fresh batch of new laws is probably not are the answer. Arming teachers isn’t the answer. Fortifying every public facility with barbed wire isn’t the answer. Many believe — and I agree — we need to look at how we treat those who are mentally ill. We need to find new ways to identify the seeds of violent behavior before it leads to a massacre. Yes, some people are broken and cannot be helped. And some people are truly evil. But many people CAN be helped. To do so, we need to increase the funding for mental health programs. We need to do far more to expend our “wellness” concept to include good mental health. I hope this can happen and we can start looking at the root cause of these tragedies. And we need to do it compassionately. Humanely, with the common good of everyone in mind. And also, I think we as a society need to take a look at how we raise our children. I am not a parent, but as a loving godfather and uncle I would say to every parents and everyone who loves a child: Make sure every day your children know how loved they are. Be a role model. Listen to them. Spend time with them. Be a family. Yeah, we’re all busy, and many of us work two or more jobs. But make the time to talk to your kids. Turn off the TV, video games, the texting and the computer for even a few minutes each day and TALK to your children. Those precious few minutes can make a difference. We reap what we sow (or don’t sow). Be the best parent you can. The time for politicizing and focus groups and the era of “nothing changes” needs to end. Now. Sandy Hook needs to be ultimate call to action. Christmas should be a time of joy. This week, most of us are not very joyful, but as you attend prayers vigils this week (there is one Thursday 12/20 at Saint Mary’s at 7:00pm), and talk about what has happened, please pray not only for the victims but for all of us, and our society. Pray for, and work for, things to get better. Every December we waste a lot of time arguing whether it’s a Christmas tree or holiday tree. But as we celebrate Christmas, Hanukah, Diwali, Kwanza, the winter solstice, or nothing at all, I think we can all agree that at this time, and on every day of the year, all we really want is to live in peace and feel safe. I pray that time is soon. May you find joy in this season, and we all work to change this world for the better in 2013. Pulse massacre in Orlando – another senseless shooting, and more tweets of thoughts and prayers – It’s time to DO something.